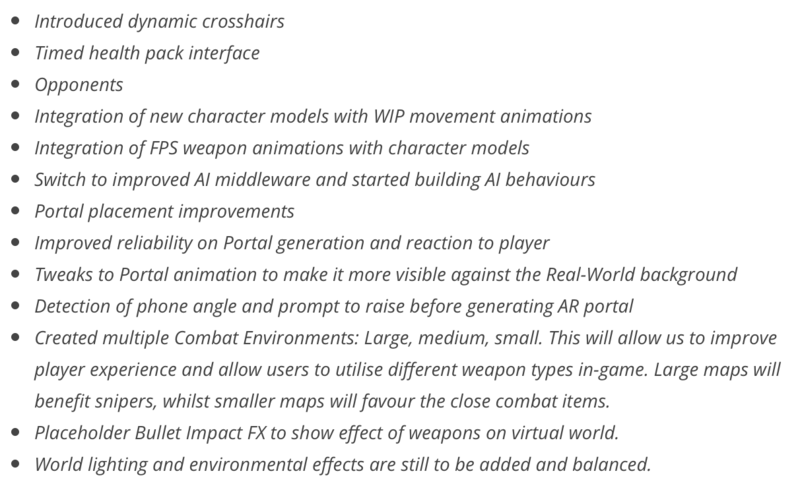 Game development has seen a huge amount of progress in the past few months and we’ve been really happy with the improvements made to the Portal – the augmented reality gateway into The Sim which is the virtual world in which all combat takes place. Placement and visibility of the Portal has been improved, which conveniently coincides with combat development and means we’re better able to test out some combat scenarios. The summer sunshine has made it a perfect (but hot!) time for our team to get outside and start playing. We are aware that there is something of a fine line between ‘hand-holding’ a player too much during the tutorial stages of any new game. 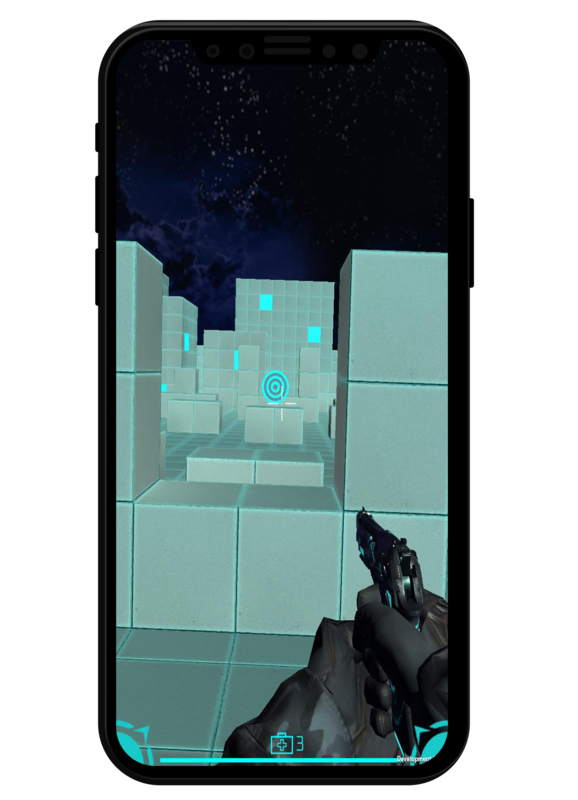 Most gamers are usually familiar with the standard concepts in games across all platforms. However, with any game, there is always a necessity to teach the basics and then allow the player to explore and learn for themselves. We are thoroughly testing and reworking these tutorials to make the experience as simple, yet time-worthy, as possible. For players entering a tutorial or practicing with a newly unlocked/built weapon, we have a series of training modes which are set within our virtual world. For every new weapon, players will have to undertake training and “git gud” before using the item in battle. 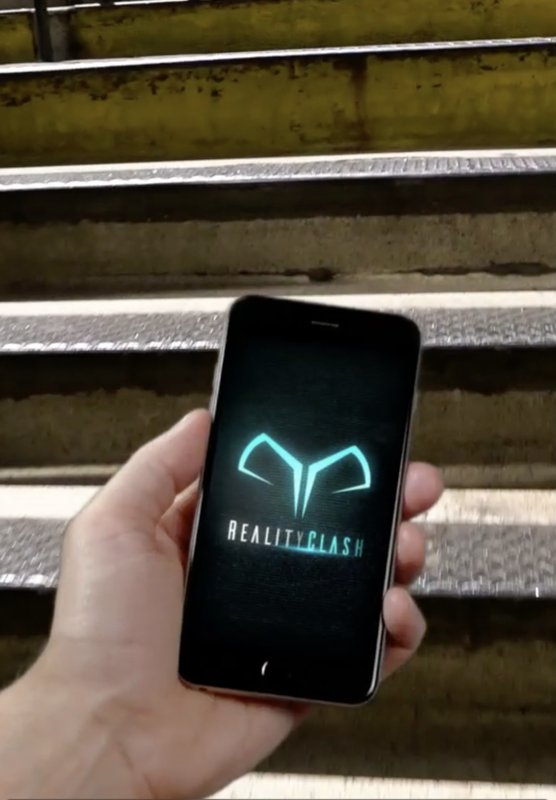 One of the most exciting features of Reality Clash is of course – the PVP combat. There has been an incredible amount of work involved in building the virtual world shown above and it is within these worlds that fighting takes place. Making this combat responsive and fun is a critical part of the ongoing process. There will be three primary teams fighting for dominance in the Reality Clash game. 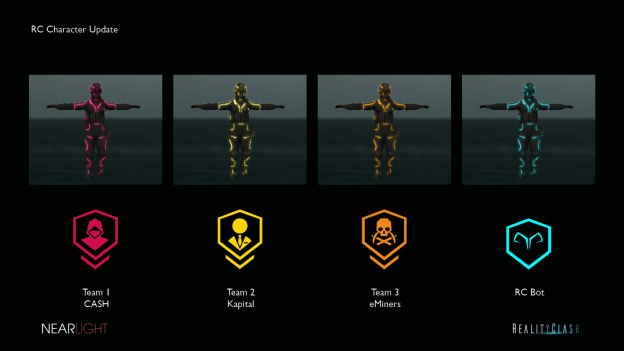 Players will be auto-assigned into one of these teams at the start of the game but will be able to change to their preferred team as they progress through the game. These teams have already been mentioned on our website in the Game Narrative section: CASH, Kapital and the eMiners. We have also been working on finalising the in-app economy and the use of Silver within the game. We had previously referred to this currency as ‘RCC Silver’ but we believe this causes confusion with our Ethereum-based token: ‘RCC Gold’. For the sake of clarity, we are renaming ‘RCC Silver’ to just “Silver”. Silver will act as the primary currency for the Reality Clash in-app economy and is a model that most mobile gamers are already familiar with. Silver can only be purchased within the app and used solely within the game to buy items, speed-up tasks and build weapons. Pricing bundles for Silver will begin at $0.99. The weapons and items which are available within the app are not tokenized and cannot be traded within the game, on the marketplace or on 3rd party exchanges. 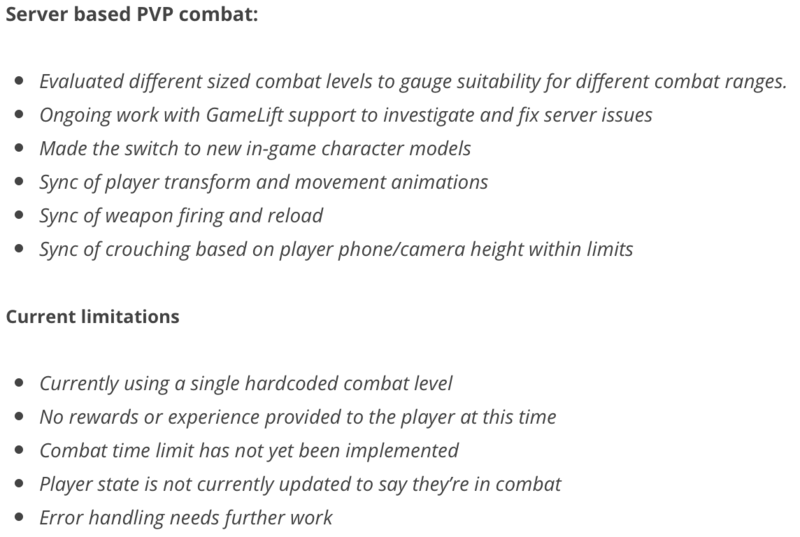 The weapons are not limited in number (unlike the tokenized assets currently available at The Armoury). As many of our community have noticed, we continue to update and expand our website in an effort to improve the user experience, especially with the Armoury store. We have introduced a discount system for early buyers, as we believe that rewarding close followers of the project is crucial. Although there is a particular focus on the User Interface, we are working hard on the back-end of the system to allow for more efficient sales at the Armoury. The automated process of Tokenization has been improved so that users receive their items in a shorter space of time. Naturally, when the Ethereum network is particularly congested, we have experienced slower Tokenization times and incurred higher fees. Users of the Armoury store are automatically signed up to our Elite Trader newsletter and will be aware of the work that we’ve been doing on the Marketplace. The Marketplace can be thought of as the next evolutionary stage of The Armoury and will be the platform where traders can list their trades and profit from buying/selling weapons with others. This begins the transition from weapons being sold at The Armoury to our community now being the ones who will be building the economy. We want to fully support the traders on our platform as much as we can and we welcome all feedback in relation to this. If you have ideas for what you want from a digital asset marketplace, let us know! We’ve created a new series of videos, with the help of our friend Simon Miller, which offer a concise explanation on some of the Reality Clash basics. Simon gives a great run-through of what the Reality Clash game is about, how Reality Clash Coins are used and how users can get their hands on these unique items at the Reality Clash Armoury. We feel that a video series (which we will continue to add content to) is a great way to help new users get an understanding of RCC and crypto as a whole. Video 1 – What is Reality Clash? Video 2 – What is a Reality Clash Coin? This allows users to manage their Ethereum-based tokens (such as RCC) and easily send/receive token payments.. Invoices for Armoury items can also be paid with a simple scan of the displayed QR code. The Trust wallet also allows you to show off your digital assets and this will enable you to see your Reality Clash weapons in the app with the rest of your token-based assets. We’re working on this feature so that when Armoury items are transferable, you’ll be able to see your items within the Trust app as well as our Marketplace and of course – the game. We want to make it easier for new users to enter the exciting world of cryptocurrency and asset trading. We are aware that many new users are confronted with complicated trading exchanges and that this deters them from getting involved. 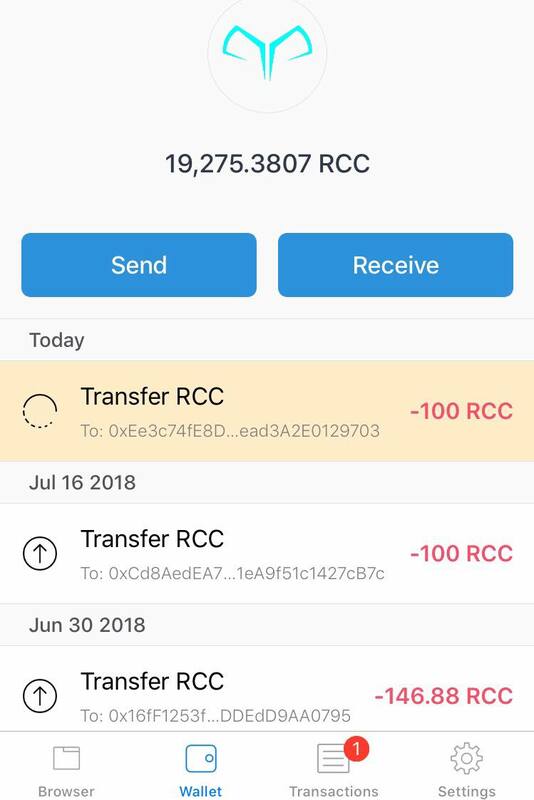 In order to help with this barrier, we will soon be offering RCC bundles on the website – with cryptocurrency and fiat payments accepted. We believe that selling RCC directly to users via the website will aid the trading economy as a whole, as new users will be able to get their hands on RCC – without the burden of visiting 3rd party trading exchanges. This will mean more traders are able to engage with the Marketplace and drive the economy. Here is a sneak peek anyway! There will be another Developer Diary in August and we hope to bring you even more details and images from the game as we draw closer to launch.